An algal bloom is a rapid increase or accumulation in the population of algae and algae-like bacteria in a waterbody. These "blooms" often result in a thick coating or mat on the surface of the water, which can also result in lowering the dissolved oxygen in the water column. Low dissolved oxygen can be detrimental to aquatic organisms, particularly fish. Certain environmental conditions, such as sunlight, high nutrient concentrations, warm temperatures and calm water can favor the development of a bloom. However, not all algal blooms are harmful. Some are merely called “nuisance blooms” because they result in discolored water and/or offensive odors. While they are not dangerous, they can result in people choosing not to swim or recreate in water that is experiencing the bloom. 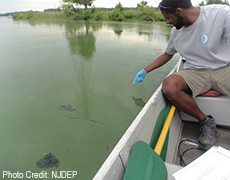 Algal blooms may occur in freshwater as well as marine environments. 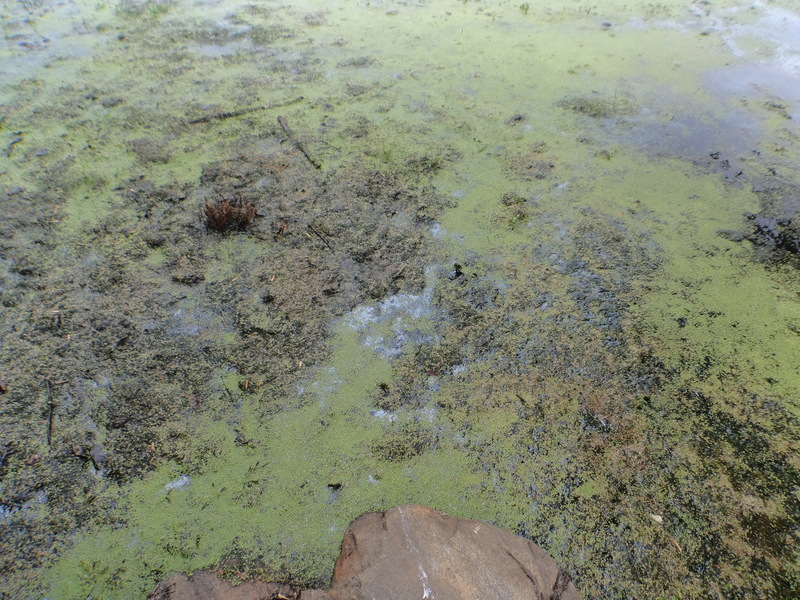 A harmful algal bloom (HAB) is an algal bloom that can be dangerous to people, animals or the ecology. Some, but not all, HABs produce chemicals that can be toxic to humans and animals if ingested, inhaled, or if contacted by skin or mucous membranes. These toxins can also accumulate in fish and shellfish which can cause illness when either are consumed. HABs can occur in both the freshwater and marine water environments. Cyanobacteria, also known as blue-green algae, are responsible for the majority of freshwater HAB occurrences. These are called CyanoHABs. Cyanobacteria are naturally present in lakes and streams and, can form both toxic (harmful) and non-toxic blooms. The toxic blooms can cause health effects when people and animals come in contact with them. Click here to learn more about CyanoHABs. 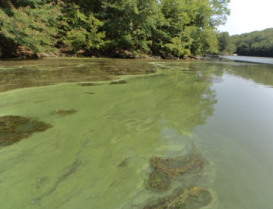 Click here to report a suspected freshwater Harmful Algal Bloom. 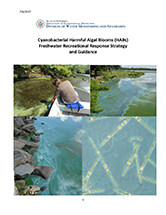 Marine harmful algal blooms (HABs) are mostly caused by single celled algae called phytoplankton. Phytoplankton are abundant in both marine and freshwater ecosystems and are an essential component of aquatic food webs. An abundance of phytoplankton can produce discolored waters and form both toxic (harmful) and non-toxic blooms. Harmful algae are a small subset of species that negatively affect human, animal, and ecosystem health and coastal resources through the production of potent chemical toxins. Marine HABs can result in various tide colors (red, green, and brown), fish kills, as well as various types of shellfish poisoning from eating contaminated shellfish. To learn more about marine HABs, click here. 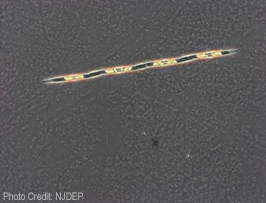 For more information on phytoplankton, and its relationship to marine HABs, click here. To report a suspected Harmful Algal Bloom in marine waters, either call the DEP’s Emergency Hotline (1-877-WARNDEP) or call your local Health Department.